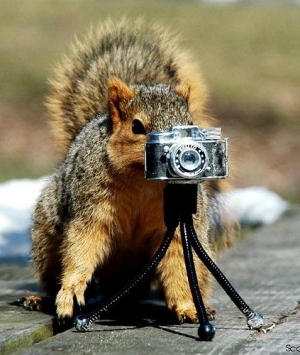 "Squirrels with cameras." That's the tongue in cheek answer I sometimes give when asked who takes the pictures of my friends and I mountain biking. The real answer is, most of the time, I do. I often wonder if the guys I ride with are annoyed with my constant picture taking. Every ride will be interrupted at least once and documented with, at minimum, a group shot. It's how I make connections and memories...but by no standards whatsoever am I a professional photographer. I have no real concept of the science, dedication, and hard work that goes into professional photography. All that being said, I love love pictures...so I take a lot of them. 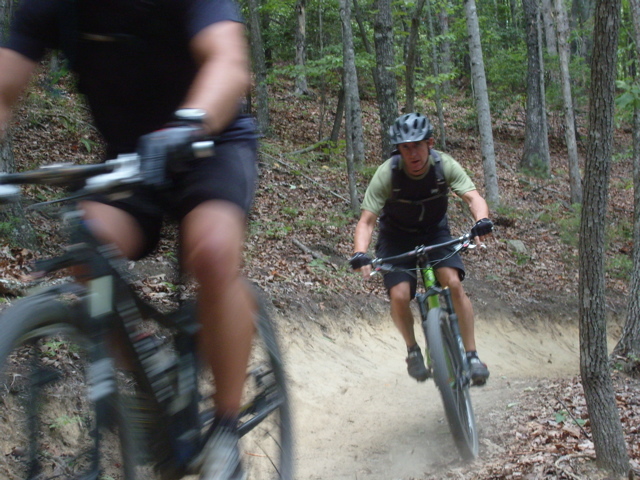 Back in 2006, when I first started riding with Mark, Tim, and the rest of the guys, I had the brainiac idea to go to Wal-Mart, purchase a couple disposable 35mm cameras, and shove them into my Camelbak with the rest of my gear. I did this for about a year. The end product being a bunch of grainy, dark pictures of us riding in the woods. (Here's some proof!) Then, in June of 2007, I purchased my first digital camera after seeing how well Mikey's worked on our trip to Blackwater Falls, West Virginia. Now-a-days, I just use my cell phone. 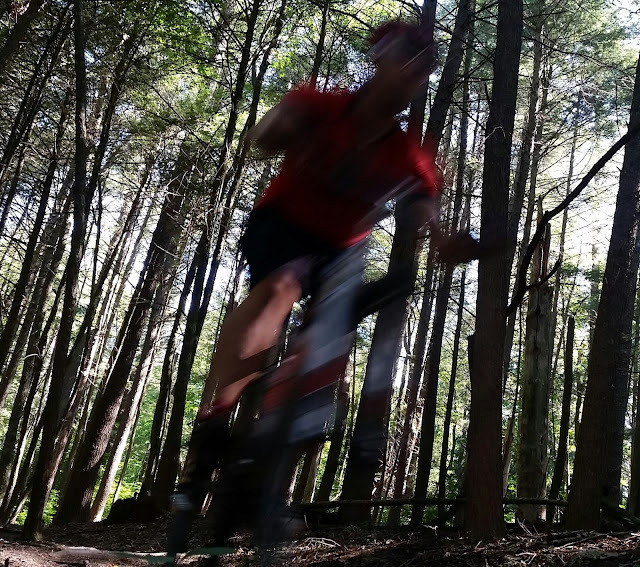 I say all this to stress that there is significantly more luck than skill involved when I do happen to snag a cool picture of a friend on a moving mountain bike. 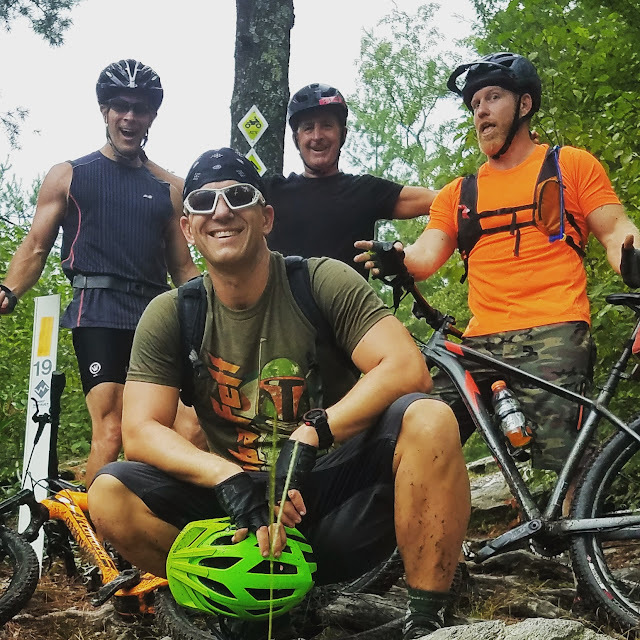 Honestly, I think most of the guys I ride with take better pictures than I do...they are the one's who took the pictures of me! 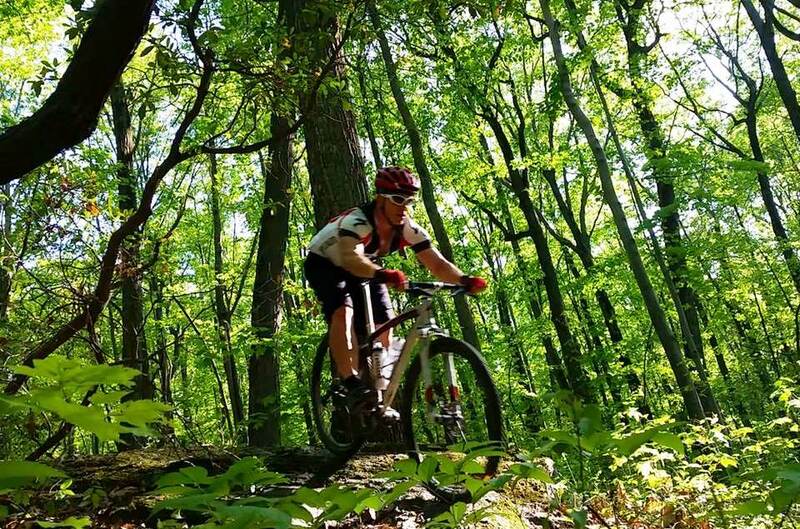 So, since I am still not "doctor approved" to ride for at least a month or two, I picked (in no particular order) my twenty favorite "friends on mountain bikes" pics. I have no idea how a professional photographer would grade these pictures...and for all I know they would think squirrels with cameras really DID take the photos... but each of these pictures bring back great memories and I'm proud of them. Enjoy! 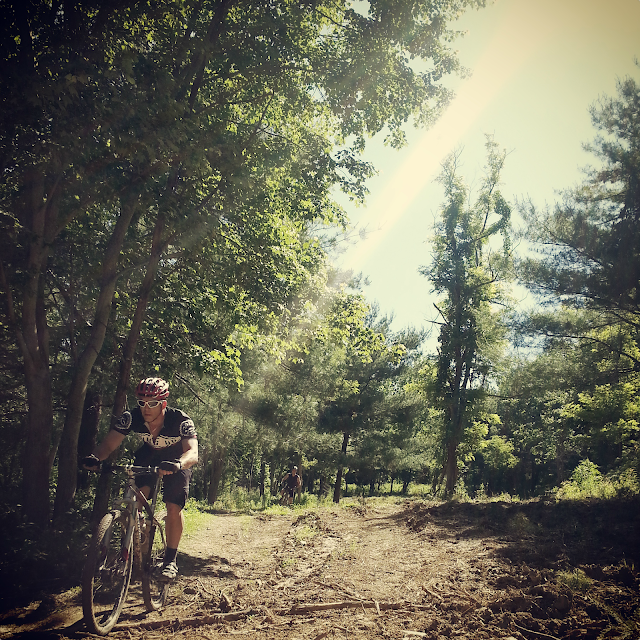 Timmy took this pic of me in Michaux State Forest. 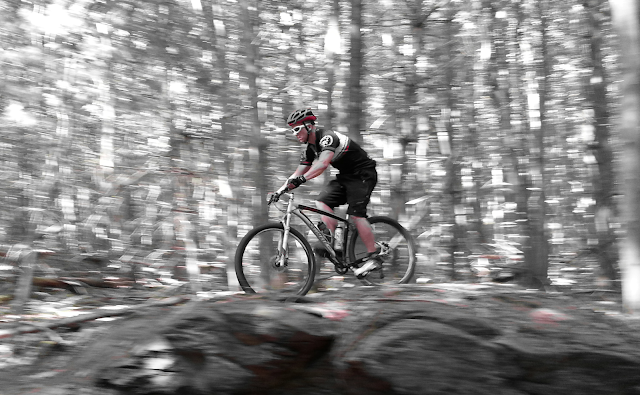 I really dig the red filter that highlights my helmet and the red trim on my 2011 Stumpjumper. One of my favs, Tim! 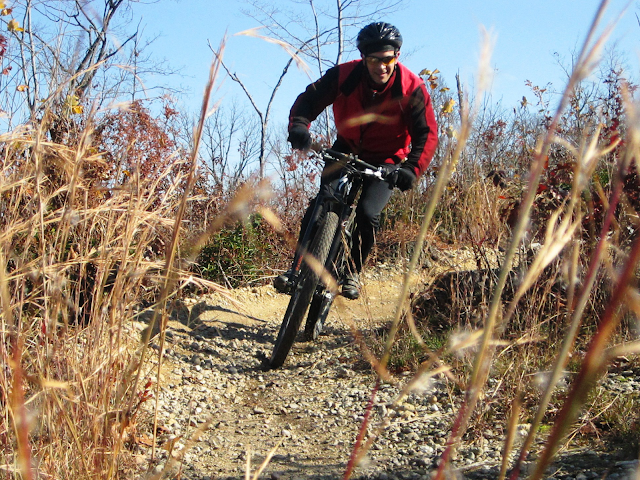 I took this pic of Chris Keller on Rusty Chair trail at Rocky Rocky Ridge County Park. I love the intensity on his face. Turn around is fair play. 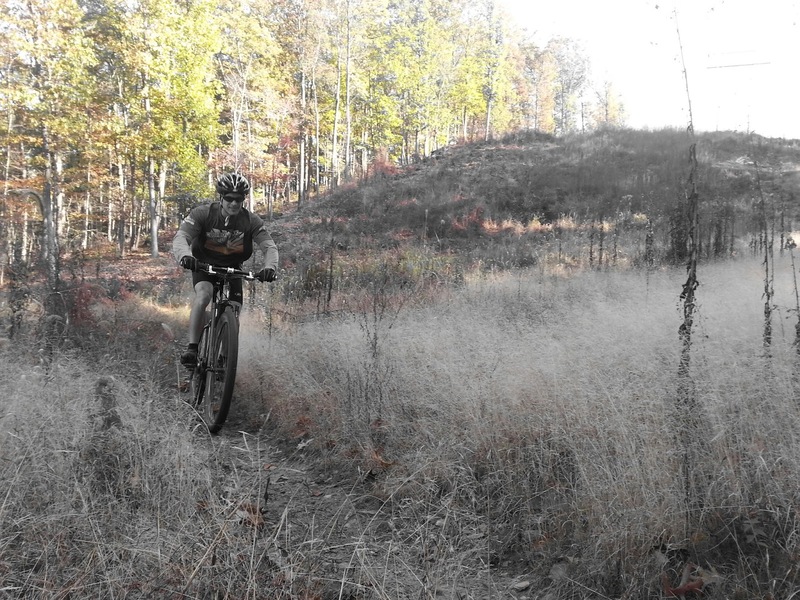 Chris Keller took this pic of me riding down trail 9 at Rocky Ridge County Park. Mark Lentz--August 2008--Pisgah National Forest, N.C.
Mark leading the way on the first ride of an incredible four day trip to Pisgah National Forest in North Carolina. Kristian Hains--August 2008--Dupont State Forest, N.C. The first of three great amazing pics I captured on Ridgeline Trail in Dupont State Forest, N.C.
Tim crossing under the power lines at the Lakes. I tried using a red & green filter. I thought the result was kind of cool. A great ride at the Lakes with Tim Sindlinger. I completely dig how the sun was highlighting the trail. 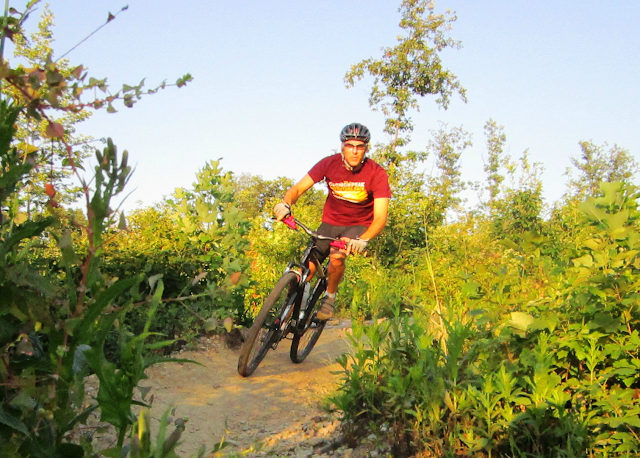 My neighbor, Brent, taking on the trails at Rocky Ridge County Park. Mikey Nardelli captured this photo of me climbing a huge rock face at the base of Cascade Trail in Patapsco Valley State Park, Maryland. Glenn Medice--August 2008--Dupont State Forest, N.C. 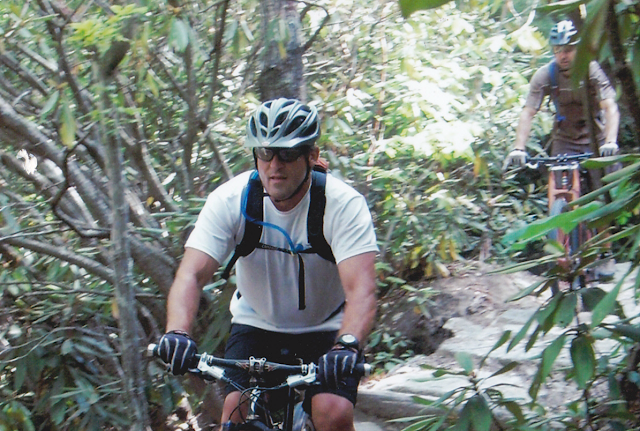 The second of three great shots on Ridgeline Trail in Dupont State Forest, N.C. 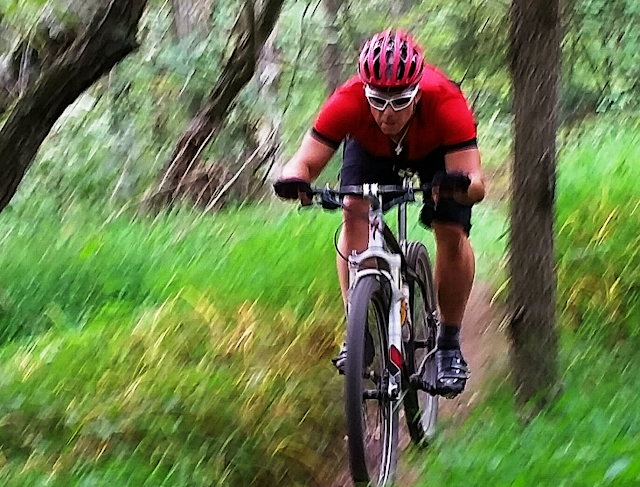 The blur in foreground is Mark Lentz. 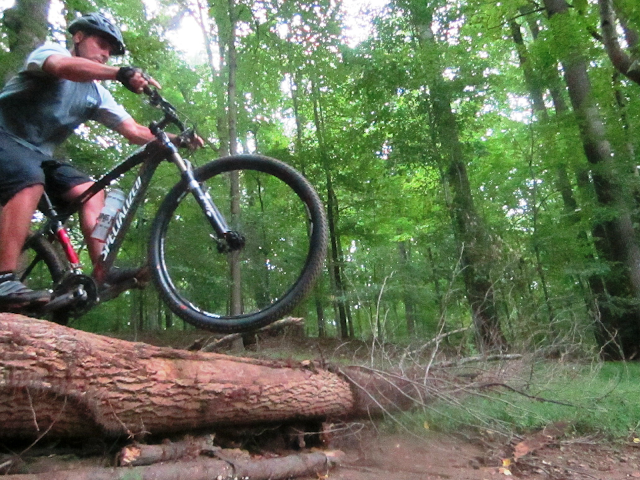 Kevin had more guts than I did when he decided to ride the see-saw set up on the trails at Lehigh Valley. I captured this shot a moment before it tipped downward. Tim Sindlinger took the pic of me dodging low branches at Swatara Gap State Park. My favorite pic to Tim. 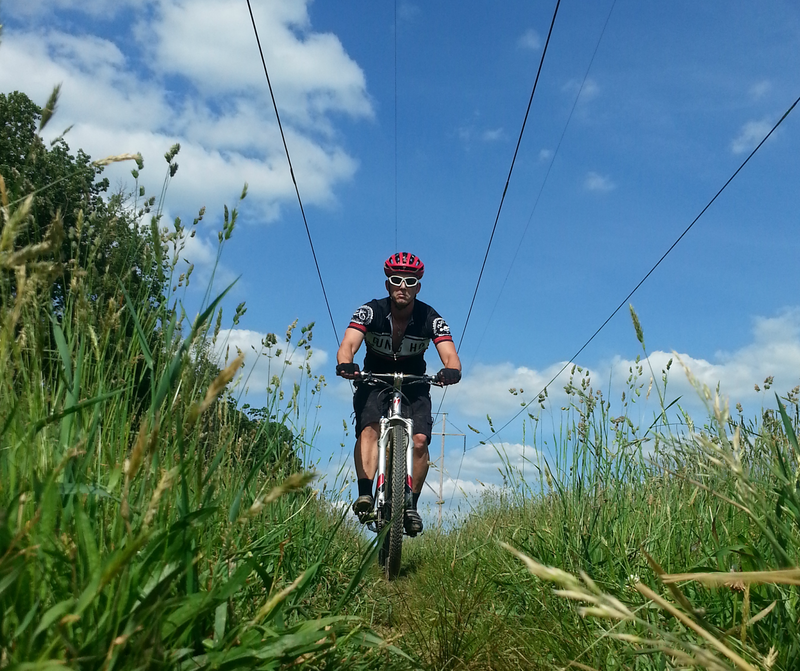 It captures, in my opinion, the essence of Tim....riding with a grin on his face. Mikey had more balls than anyone else riding that day when he decided to ramp off of this log build up. The picture doesn't do proper justice to scale of this stunt. Nicely done, Mike. It's not every day that a recumbent cyclist rides past as you are waiting for a friend to fix a mechanical. It's also not every day that the recumbent cyclist offers to let you ride his bike will your friend continues to work on his mechanical. Mark took advantage of it. Looks like fun! Tim Sindlinger took this straight on shot of me riding on trail 1 on the top of the ridge at the Lakes. 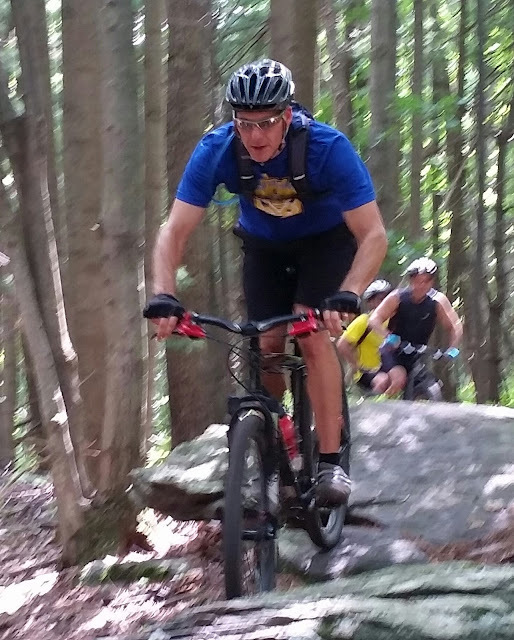 Chris Keller taking his turn on the rocks south of Woodrow Road in Michaux State Forest. 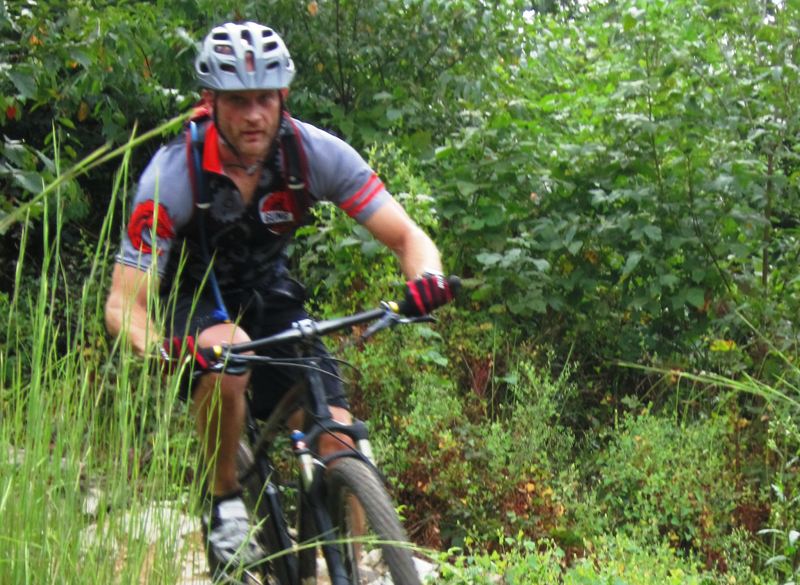 Mild mannered bike shop service manager during the week...mountain bike daredevil on the weekend. Derrick boldly goes where I choose not to. 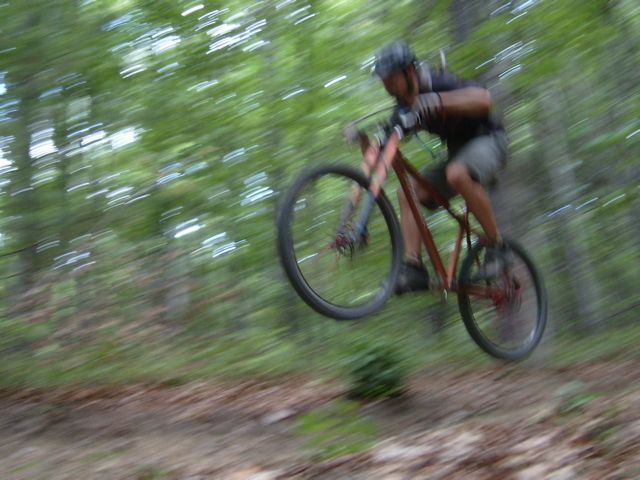 Tim Sindlinger somehow shot this ghostly image of me riding trail D at Swatara Gap State Park. Where the heck is the front of my bike?! Amazing! In my opinion, the best mountain bike pic that I've ever taken. 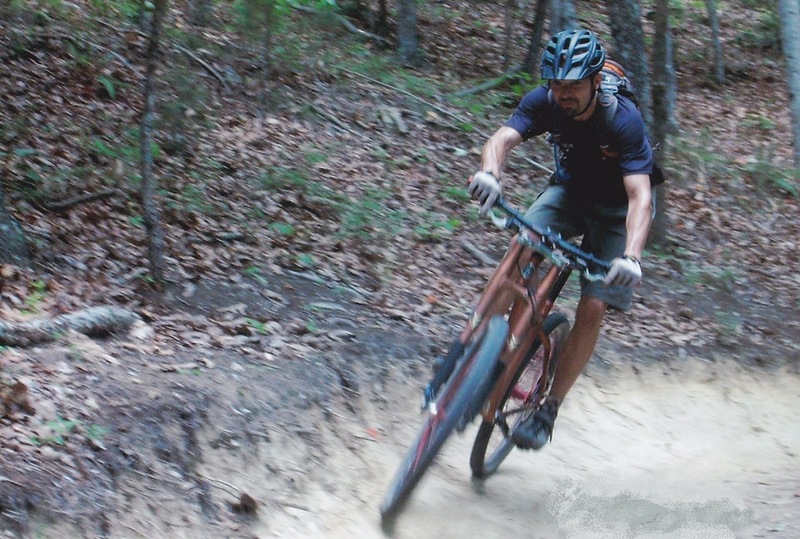 Kristian Hains getting some massive hang time on Ridgeline Trail in Dupont State Forest, N.C.
Be sure to check out the All Trails Lead To Ice Cream website for all of our ride pics!